The Best Black Podcasts from thousands of Black Podcasts on the web using search and social metrics. Subscribe to these audio podcasts because they are actively working to educate, inspire, and empower their readers with frequent updates and high-quality episodes. Black Podcast newsletter is a comprehensive summary of the day's most important audio podcasts episodes from the best podcasters on the web, and delivered to your email inbox each morning. To subscribe, simply provide us with your email address. Mount Holly, NC About Podcast Black Talk Radio Network is the world's largest independent black digital radio and podcasting platform producing content of relevance to African-Americans and the African Diaspora. Facebook fans 25,298. Twitter followers 6,926. Brooklyn, NY About Podcast The Nod tells the stories of Black life that don't get told anywhere else, from an explanation of how purple drink became associated with Black culture to the story of how an interracial drag troupe traveled the nation in the 1940s. We celebrate the genius, the innovation, and the resilience that is so particular to being Black -- in America, and around the world. Facebook fans 1,157. Twitter followers 6,167. About Podcast The official blog talk radio show for the new Black Panther Party. Black Power! All Power to the people! Facebook fans 36,266. Twitter followers n/a. About Podcast Bomani Jones weighs in on sports, pop culture, social topics and much more from NYC. Facebook fans 36,508. Twitter followers 452,103. Oakland, CA About Podcast Mixes real stories with killer beats to produce cinematic, and dramatic radio. Hosted by Glynn Washington. Facebook fans 126,774. Twitter followers 24,657. Austin, Texas About Podcast In Black America is a long-running, nationally syndicated program dedicated to all facets of the African American experience. John Hanson profiles a diverse selection of current and historically significant figures whose stories help illuminate life in Black America. Guests include civil rights leaders, educators, artists, athletes and writers describing their experiences, achievements and work in chronicling and advancing the quality of African American life. Facebook fans 43,984. Twitter followers 92,011. About Podcast The award-winning radio program "Reveal", produced by The Center for Investigative Reporting and PRX. Hidden stories, uncovered - that's what this show is about. It takes you deep inside stories that impact your world, revealing injustice and holding the powerful accountable. The first-of-its-kind investigative program on public radio, "Reveal" is hosted by Al Letson and updated regularly. Virginia About Podcast Black Girl Nerds is a podcast and place where girls of our ilk can express themselves freely and embrace who they are. This is not a show exclusively for Black women, but it is a show exclusively for Nerds! Facebook fans 39,345. Twitter followers 149,264. Atlanta, GA About Podcast The Therapy for Black Girls Podcast is a weekly chat about all things mental health, personal development, and all the small decisions we can make to become the best possible versions of ourselves. Join your host, Dr. Joy Harden Bradford, a licensed Psychologist as she offers practical tips and strategies to improve your mental health, pulls back the curtain on what happens in therapy sessions, and answers your listener questions. Facebook fans 109,752. Twitter followers 8,530. Ratchetville, USA About Podcast The Black Guy Who Tips is a podcast / blog from the minds of Rod and Karen, a married couple who enjoy ratchetness. Rod and Karen have been together since they were 16 and have been married since 2002. The show has been mentioned in the Huffington Post written about on Ebony.com and spotlighted on Spreecast. Facebook fans 6,499. Twitter followers 5,542. About Podcast Emmy Award-winning producer, actor, and comedian Larry Wilmore is back on the air, hosting a podcast where he weighs in on the issues of the week and interviews guests in the worlds of politics, entertainment, culture, sports, and beyond. Facebook fans 3,048. Twitter followers 224,987. NYC About Podcast Join media personalities Kid Fury and Crissle for their weekly "read" of hip-hop and pop culture's most trying stars. Facebook fans 41,491. Twitter followers 94,425. Atlanta, GA About Podcast Revision Path is a showcase of the world's Black graphic designers, web designers, and digital creatives. Each week, Maurice Cherry interviews these designers and developers about their work, their inspirations, and more. Voted "Most Inspiring Design Podcast" in the 2015 Creative Market Awards! Facebook fans 1,208. Twitter followers 2,581. Los Angeles About Podcast Innovation Crush smashes convention to bits by profiling some of the world's most daring projects and the people behind them. From marketing ideas to technology innovations, disruptive business models, personal development, and everything between, IC is a one stop shop for all the "who-to-know" and "what-to-know" you'll ever need to know. Hosted by long-time idea maker, Chris Denson, the show serves up a giant helping of some of the best minds around the world, all with a heaping side of occasional bad jokes. Facebook fans 1,863. Twitter followers 9,131. About Podcast 3 Black guys reppin all black geeks everywhere!!!! We review the best Black movies, Action, Martial Arts, Anime/Manga, Comics, and everything that white people think black people aren't into. Facebook fans 778. Twitter followers 3,381. The Bay Area, CA About Podcast Blacker Than Black Times Infinity is a podcast hosted by geeks like you. Come listen as we talk about the games we are currently playing and our take on upcoming games we are looking forward to. We cover comics from all different publishers. We have been Anime fans since the time we were kids and which we cover in-depth. We review movies and TV shows and give our thoughts. The fun doesn't just stop there. Come listen to some guys having fun. Podcast are updated every Wednesday Nights. Facebook fans 395. Twitter followers 6,972. About Podcast Both transplants to Atlanta, Alex and Lyric are spoken word artists seeking to highlight both independent and local talent while bringing us all together through music, poetry, and #BlackGirlJoy. Epistemology Quest About Podcast We are here to challenge you to think and live for yourself, not convert you. Facebook fans 2,036. Twitter followers 7,633. New York, NY About Podcast A podcast featuring women of color with very different views on Hot Topics. Facebook fans 1,112. Twitter followers 1,295. Worldwide About Podcast A podcast at the intersection of Comics and Blackness. Join us as we chat with comic creators and promote diverse comix! Hosted by Anthony Otero, Marcus Kwame, Leonardo Faierman, Grace Gipson, and Thelonious Legend. Facebook fans 85. Twitter followers 9,350. Los Angeles, CA About Podcast A new weekly podcast co-hosted by 4 friends living in LA who happen to be 30 Something, Black, and Gay. Witty, sometimes petty, insightful and always opinionated, these 4 take no prisoners when it comes to commentating on current events, celebrity gossip, the entertainment industry, love and relationships. Facebook fans 200. Twitter followers 95. About Podcast Joblogues is hosted by childhood friends, Joymarie and Cortney, and highlights candid, career conversations with young professionals around the globe. Our podcast has been featured by iTunes, Refinery29 and more and has a highly engaged audience of multicultural women who tune in monthly for career advice, inspiration and lots of laughs. Facebook fans 1,082. Twitter followers 1,992. Los Angeles, CA About Podcast This is where you Ask A Black Woman anything but... You betta be ready for a real answer! Facebook fans 739. Twitter followers 961. 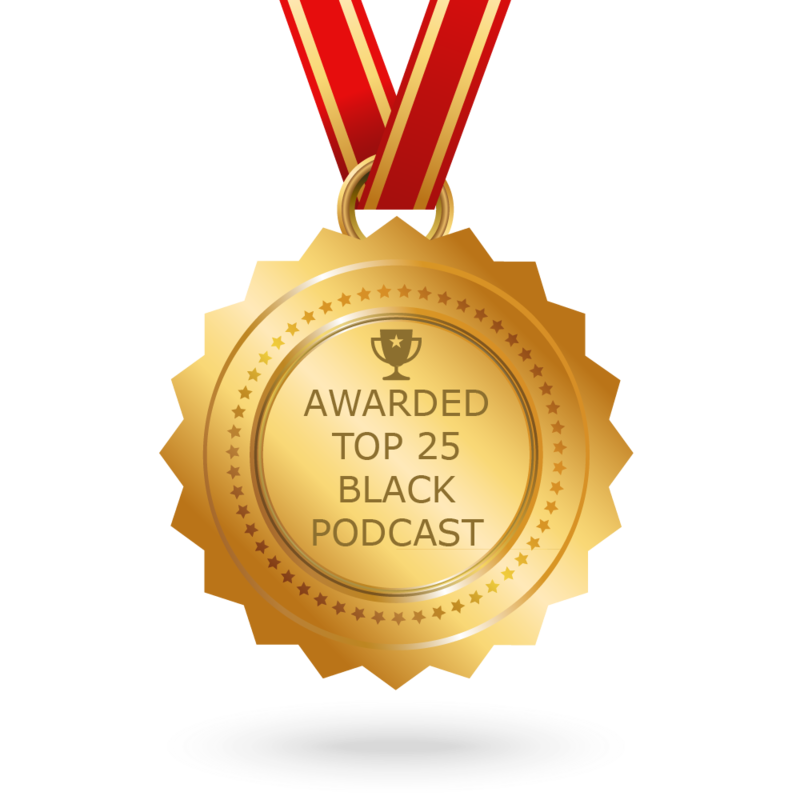 CONGRATULATIONS to every podcaster that has made this Top Black Podcasts list! This is the most comprehensive list of best Black Podcasts on the internet and I’m honoured to have you as part of this! I personally give you a high-five and want to thank you for your contribution to this world.